Restore Moms Retreat will help you find joy again as a mom. If you have felt like you needed a “get-away” here’s your chance! I have the privilege of being the key note speaker this year, but you have to register soon. Join Sue Detweiler in the beautiful hills of Tennessee April 20-22 at lovely NaCoMe Camp & Conference Center. Sue is bestselling author of 9 Traits of a Life-Giving Mom. Lisa Sanford was worshiping at church one Sunday, standing next to her husband Steven (whose arm she likes to feel around her as she leans in to God) when she heard a voice. She says the voice wasn’t audible. But it was so clear. God asked her to start a women’s retreat specifically for moms. But Lisa listened and began doing the legwork, the research, and the networking, all while letting the Holy Spirit lead. You see, she knew how important this task of building a place for rest for weary moms was because after the birth of her second son, she needed rest, she needed restoration. Restore Moms Retreat began to take shape in her heart. 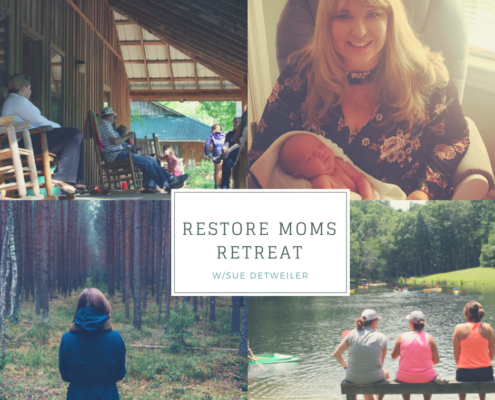 Restore Moms Retreat was built out of Lisa’s obedience to a God who was there for her when she reached her darkest hours in the grips of postpartum depression. Lisa knows what it means to feel tired and lost and hopeless, and with Restore, she seeks to show women how God sees all they do, from diaper changing to kissing boo-boos, from sleepless nights to mountains of laundry. She wants mothers to remember that they are first and foremost daughters, and that their Father wants to take care of them. “‘Come to me, all of you who are weary and carry heavy burdens, and I will give you rest. Take my yoke upon you. Let me teach you, because I am humble and gentle at heart, and you will find rest for your souls. For my yoke is easy to bear, and the burden I give you is light.’” Matthew 11:28-30 (NLT). That’s the essence of Restore. Letting moms rest in Jesus. Restore launched last year at Five Star Retreat outside of Nashville, Tennessee. Moms cozied up in a lodge, around a fire and learned about their identity in Christ. They made friends, ate yummy meals together, and were taken care of instead of taking care of everyone else. Restore will hold its second annual retreat on April 20-22 outside of Nashville, Tennessee, and is so excited to welcome Sue Detweiler to be a key note speaker. Sue is a best-selling author of 9 Traits of a Life-Giving Mom and founder of ChristianMomTalk which gives daily encouragement to moms. Registration deadline is approaching.Visit www.restoremomsretreat.com for all the details. 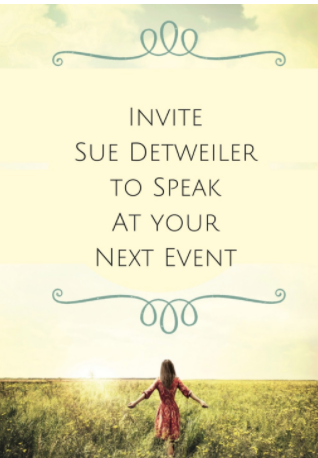 If you would like to invite Sue Detweiler to speak at your next event — call 903-776-4712 or email rachel@suedetweiler.com.